Hey, here's a question? Why do we have a playoff system which lets a team get to the playoffs when there are seven teams better in the league? Not a rhetorical question - NL standings 30 August '05. This year, not much (if any) better: World Champions were fifth in their league!!!! I hate the playoffs anyway, but couldn't we at least take the four best teams? But, while it's here, even in its current debased state, it's still the closest thing to perfection our species has ever devised. As Ecks told Mulder on The X Files: Baseball. It's useless, but it's perfect. And there are other sports out there, as well! Here're the teams I follow. UT Lady Volunteer Basketball My first love! 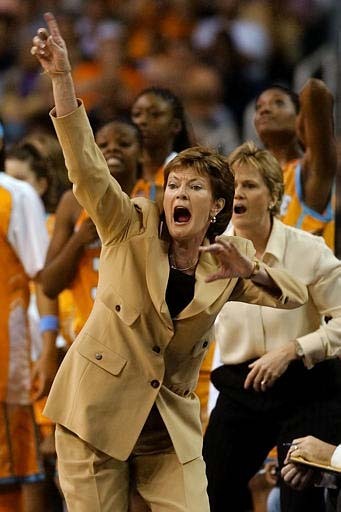 Pat Summitt's ladies have won the Championship seven times. In the Championship game ten times. The Final Four eighteen times, twenty-two for the Elite Eight. Been in the Sweet Sixteen twenty-six times - that's every year since there's been one. No Tennessee player has ever graduated (and they all graduate) without going to the Final Four at least once. Ever. Oh yes... Pat has more wins than any other coach. Any other coach. So the Lady Vols won back-to-back Championships! W00t, indeed! Washington Mystics Women playing basketball professionally? In America? It's about time! The Mystics are more or less my default team, since I live here, but I enjoy watching them play. Go Mystics! But they had a terrible season: sixth in their conference, and worse than anyone in the West. Next year, a little better! Atlanta Braves I was a Braves fan back when hardly anybody was. I remember going to Fulton County for a weekend series with the Dodgers, less than 3000 people in the stands. I remember falling in love with Knucksie. I remember Dale Murphy and Glen Hubbard and Bruce Benedict... Now they're all winning and wonderful, but a teeny part of me liked it better back then. Only a teeny part, though! Even less interested in baseball this year than last - hardly thought that could happen. We all know how it turned out - the #2 team (Phillies) in the NL beat the #2 in the AL (Tampa Bay). And the Phillies were worse than three teams in the AL. That happens. It's better than it might be, but worse than it should be. The Braves had a terrible year, just like last year - actually worse. So: Next Year In Atlanta! But again ... Angels and Cubs, best teams in their leagues. Not in the Series. In the words of the immortal Earl Weaver: "This isn't football. We do this every day." So I'll keep a running tally here, but will only post if something major happens. The Orioles finished last. Tampa Bay, once the reliable basement dweller, actually played in the Series. Had a worse record than LA, but that's the playoffs for you. The Orioles were almost the worst in the league, but Seattle sewed that one up. Their record was worse than last year, but nobody was as good as the Yankees were then, so they weren't as many games back. So... 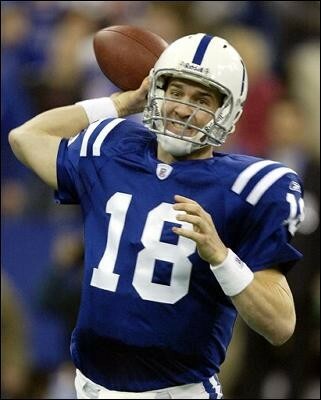 This year in Baltimore? The Tennessee Smokies now the Chicago Cubs' AA Farm Club. Yes, they've changed again... after 23 years with the Blue Jays, a period which followed 8 years with the White Sox, the Smokies have been changing every couple of years. We'll see how long this Cubs thing lasts... at least the bear matches! But the major league club isn't the main thing - this is minor league ball. It's different. No, there really is something about minor league ball. I'm not going to get all teary and nostalgic and claim these guys are like the big-leaguers used to be, 'cause I don't believe that's true. But, I am going to say, there's something about a small, exquisite ballyard in the mountains, with a small but fanatical home-town crowd ... If you can get up to Sevierville, or any minor league park, you should. It's a whole 'nother experience! You can listen to all their games at Smokies Baseball.Com. The Montreal Alouettes / Les Alouettes de Montréal Gone north but not forgotten... even if the Ravens did win the Super Bowl this year, I still prefer these guys. Canadian football is faster, with fewer of those "committee meetings" and more excitement ... and anyway, how can you love the NFL? By the way ... the Alouettes used to play in Baltimore (where they were the Stallions), and they played for the Grey Cup in '94, and won it in '95 ... before the NFL drove the CFL back north of the border with its expansion/movements and the foul Ravens came to Baltimore. I don't even have a comment. They beat us. They were the better team, they played better than we did today, and there nothing else that we can say. They're Champions, they played hard and they deserved it. Next year it's all new again. Passion. Pouvoir. Fiert�. Nos Alouettes! Pride. Passion. Power. Our Alouettes! This year in Montreal! Cette année à Montréal!